The boom of SEO and social media has naturally made companies shift their marketing efforts to an online medium. With the majority of professionals searching for businesses online, SEO is critical if you want to be found and social media provides a personality to your place of employment. Both marketing methods are necessary for success, but despite being in an online world, it’s wise to invest in offline marketing techniques that are equally as important. While social networking has reduced the need for networking face to face, the number of public events, conferences and gatherings are on the rise. People are looking to connect and share ideas with the folks they may only know from Twitter or Facebook. New conferences, Tweet-ups and events appear to be increasing every week! 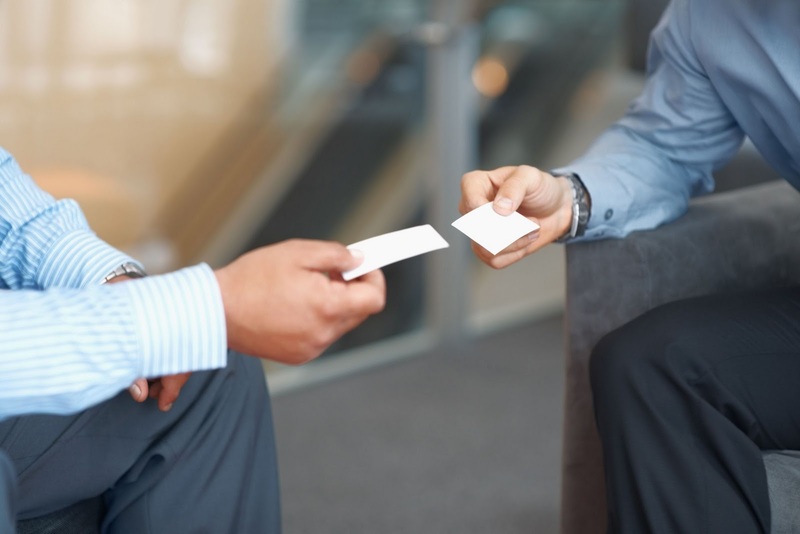 Business cards are fundamental in making a good first impression. Although the information we put on our cards has adapted over the years, they are still just as effective as they were in the past. Below are some tips to ensure yours stand out. Your online presence shows off your personality. Your business card should do the same. Chances are several people at the events you attend may already “know” you without ever having met face to face. They follow you on Twitter, read your blog, or like your Facebook page. They have an expectation of who you are without the formal introduction. A mediocre business card will not reflect the person they already know online, so give your card the same personality that you exhibit there. Many individuals may already know you, but keep in mind that you’ll be handing out your card to plenty of people that don’t. Include links to the social media sites you frequent or consider adding a QR code that links to your website. Email addresses and phone numbers are still essential, but don’t forget to offer alternative options as a means of connecting with you. A cluttered business card is unattractive and can send the wrong message, so only add what you feel is requisite. Avoid adding links to every site you associate with and consider only those that you use frequently. Don’t be hesitant to use both sides of the card. There are volumes of online options to obtain free business cards, however be mindful that you get what you pay for. Most of those complimentary sites require you to share real estate with the printing company and print on paper that is not nearly as attractive as what you’d get if you invested a little money. Remember, your card is a first impression, so don’t skimp. Business cards continue to be vital to marketing efforts, even in a world where the majority of them take place online. Your card should provide different avenues to reach you and flaunt your personality so you can network with confidence. How have your business cards evolved over the years? What links do you include on your cards? Let us know in the comments. It still kind of baffles me that people still put fax numbers on business cards.